One of the test booths in a Westfield shopping centre. LG has released the results from a test conducted with Australian consumers in Westfield shopping centres around Australia, saying that four out of five Australians prefer its passive Cinema 3D televisions over competitors Sony and Samsung. The blind test, organised and administered by market research company TNS Global, was run in shopping centres in NSW, QLD, VIC, WA and SA for ten days in October 2011. 4060 consumers were asked to compare the 3D picture of two unmarked and camouflaged TVs, and choose their preferred picture. The TVs were set in their default ‘home’ settings with no expert calibration. LG says that 82 per cent of Australians picked the LG Cinema 3D television as having superior 3D — the test did not ask specific questions and simply asked consumers to “choose which viewing experience they preferred”. These results are near-identical to similar tests conducted in the US, with 80 and 82 per cent of consumers choosing LG over Sony and Samsung (20 and 18 per cent respectively). LG’s top Cinema 3D TV — the 47in LW6500 LED — was compared to a 46in Samsung Series 6 and a Sony EX720. The LG costs $2399, the Samsung costs $2699, and Sony’s contender retails for $1649. 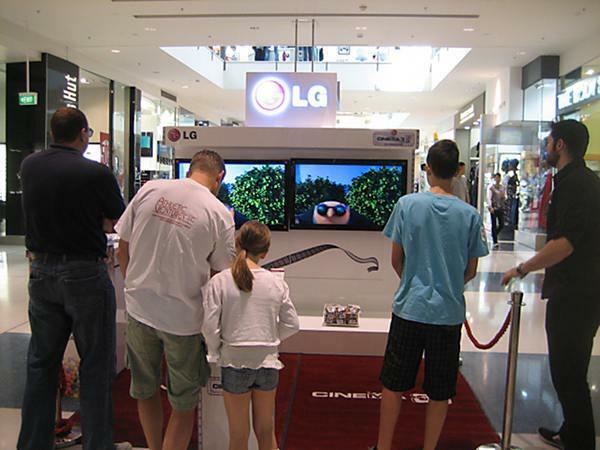 An LG-branded demo reel was shown simultaneously on both TVs, with consumers switching between viewing the LG TV with LG passive glasses and the competitor’s set with matched active-shutter 3D glasses. After the favourable results of the test, LG will be running an advertising campaign extolling the virtues of its passive Cinema 3D TVs. A limited-time $300 cashback promotion on some LG TVs will further entice consumers over the Christmas period. LG’s triumphant announcement was accompanied by news the company has partnered with Oakley to produce high-end 3D glasses, with Red Bull to showcase Red Bull TV content on its Smart TV Internet-enabled televisions, and with PGA Australia to promote the Australian leg of the golfing tournament with an app.